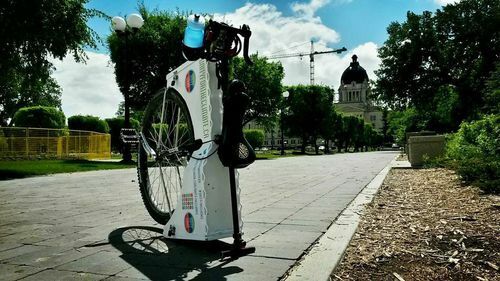 A Canadian man is calling attention to a political issue important to him by traveling 3,000 miles using a unique form of transportation — a unicycle! Sunny skies in Maple Creek. Maple Creek was a great introduction to Saskatchewan. 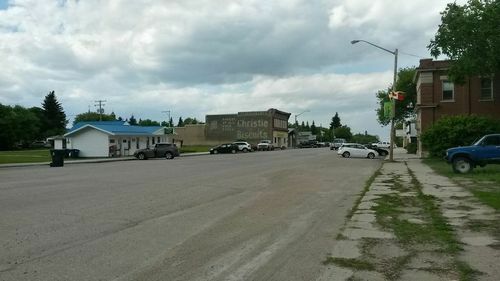 Over a few shallow hills, the town hides from the noise of the highway over some rolling hills, resting comfortably before the sprawling Cypress Hills. mountains. 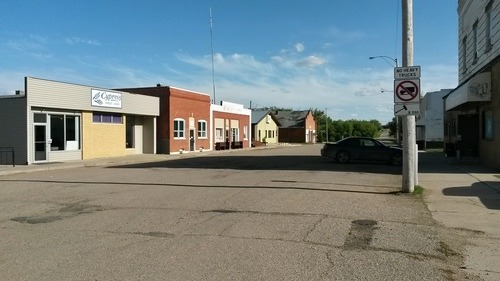 Although considered the ‘gateway’ to the Cypress Hills Interprovincial Park, Maple Creek is really a farming community through-and-through, whose population numbers have remained almost as static as its infrastructure, leaving the town isolated in a seemingly immovable time and culture all its own. 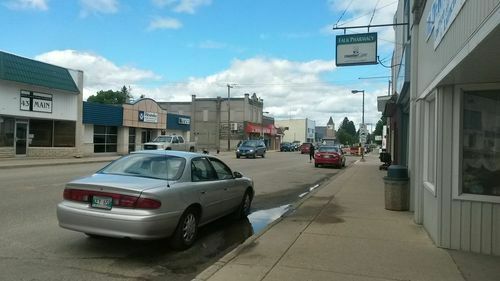 A couple gas stations and a Subway restaurant on the main drag leading towards the historic ‘downtown’ are the only franchises. The rest of the plentiful businesses are humble prairie diners, jumbled consignment markets, ma and pa specialty shops, bars and bustling late-night convenience stores. After a brief visit to the local café, I found a modest lunch in one such convenience store, where I also sat and wrote for a time before checking into my stay for the night. The Inn at Redmond House was an amazing break from camping, generously provided pro-bono. 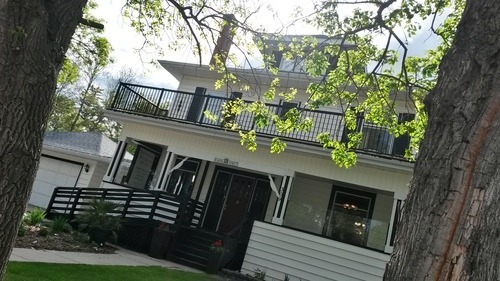 The Inn at Redmond House was my first and only sponsored accommodation in Saskatchewan, and boy did it set a high bar for the remainder of my journey (not yet reached since). A heritage B_B-style Inn, it merges the peaceful, historic atmosphere of the original property with modern décor and convenience and fine dining in a warm common area that also borrows influence from 50s culture. It all works surprisingly well, and owner-operator Michael accommodated my every need. As I was wheeling my unicycle over to the garage for safe storage, a curious passer-by pulled up outside the Inn and stepped out to introduce himself. Within seconds Shane had offered to take me up to the Cypress Hills later that evening: “The part tourists never see.” Initially disappointed I wouldn’t have time to make that detour on my uni, it didn’t take much convincing to bring me on board. After a dinner at the Inn of fresh Basa with seasoned rice and veggies – unsurprisingly perhaps the best meal I’d had the entire trip – I met Shane and his excitable mutt Frodo (or Phrèaudeux, Shane insisted, upon learning of my French origins) for my guided tour. 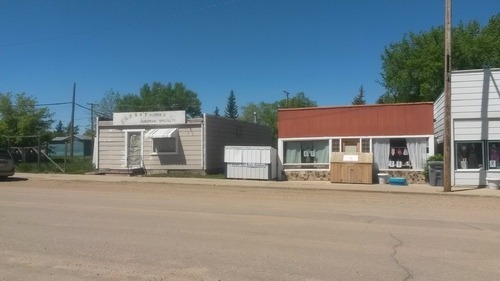 Downtown Maple Creek has an especially timeless quality about it. Shane’s friendly, humorous expression was mirrored in his casual posture. Every so often his easygoing presence would be interrupted with a thoughtful pause so intense it seemed to freeze his entire being. It was quickly clear that Shane didn’t fit any prairie stereotype. Instead he was caught somewhere between a stone-faced cowboy, a jovial farmer, and a modern man of science. The curious combination could be explained in his colourful past. Born of generations of Maple Creek ranchers, he reminisced of riding horseback as a child for miles across the sparse, pristine seas of wild grasses and cultivated pastures draped between the Cypress Hills and the richer agricultural lands to the North: his end destination was the magnificent comic book collection his neighbours so enviably possessed. Everything within site was part of his vast playground, owned by family members and close friends. There was no one, and nothing, that Shane didn’t know about the farms surrounding Maple Creek when he was young, but as he grew older he became aware that there were many things he didn’t know about the land itself. Health issues had given Shane the excuse he needed to study environmental science; two dirty words among many of his peers. Lifelong Maple Creek-local Shane took me out to explore the gorgeous eastern range of the Cypress Hills. A devote atheist and environmentalist, Shane may be seen as an oddball to some, but he undoubtedly demands a level of respect from those who truly know him. As he deftly navigates an endless web of unmarked gravel roads, we stop several times and Shane instantly identifies all the indigenous plants in the vicinity, even the ones hiding in the shadows of the vast, dry grasses. Common names, nicknames, Latin names; Shane knows them all. But more impressively, he knows how they interact and contribute to the ecosystem, as rich as it is rare. How the crushing glaciers of the ice age divided the Cypress hills into the distinctive plains now differentiated by a virtual border between deciduous and coniferous trees. How the thousands of trampling buffalo of centuries past chiseled the distinctive ridges in the hills. And how each tract of land bears the evidence of its owners respect and philosophy; responsible ranching that nourishes the landscape, or destructive over-use that leaves bare trees and erosion that is virtually irreparable. Just below the grassy surface, the Cypress Hills are pure rock; large swaths not protected by the Provincial Park are quickly being exploited for this. Shane’s knowledge is impressive but his passion is contagious. Through his eyes, I see the standout beauty of the region, which so many would overlook as yet another flat, barren scrap of ‘boring prairies’. Where the shining Golden Beans aren’t overwhelmed by dandelions, the wildflowers gracefully settle into a pastel landscape of a dozen different grasses; where thin topsoil can be peeled back to reveal a collage of smooth, red stones, untouched for thousands of years. Where the spring water is pure and tasty while a boil advisory hangs over the musty-tasting residential supply. This, indeed, is a special place. As the sun sets, Shane takes me to one final location. Murraydale is now a ghost town, save when the annual rodeo returns to town (Maple Creek’s ‘other, secret’ rodeo). The automobile has made the place obsolete, but a few deteriorating cabins stand as a reminder of a foregone era. 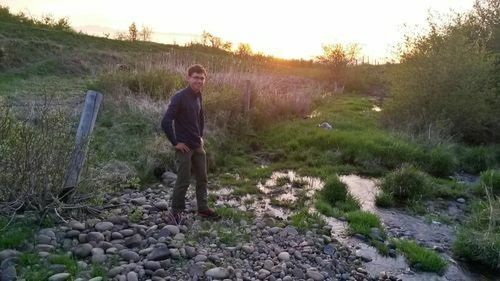 An era that existed in Shane’s lifetime, when conquering this harsh but beautiful landscape meant a level of locality, community and connectedness that is no longer known, even in the tightknit town of Maple Creek. We conclude our tour with a stop at the local bar; a place Shane also has stories of going back well before drinking age. Realizing I’m not in craft-beer land anymore, I try not to be conspicuous by ordering a Heineken. They don’t have any. “You’re in Saskatchewan now,” Shane murmurs. “You’re supposed to order a Pilsner.” Forever a hopeless tourist. Murraydale was once an independent community, complete with general store, post office, and homes aplenty. Today, only the rodeo grounds still find use. 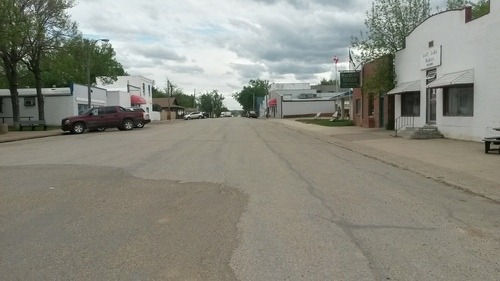 Like many smaller towns further East, most of the roads in Maple Creek are not paved. A small trace of the stubborn old nature of these places. It’s no wonder Shane’s scientific preaching’s receive a mixed reaction. Yet, he finds his message of conservation strikes a chord for those willing to listen. I mention off-handily my endless confusion with our Western culture; perhaps the only one where ‘environment’ has become a threatening term to many. We talk about Svente Arrhenius, who speculated back in the late 1800s that climate change would provide farmers extended growing seasons and a huge potential bounty. We both agree he was probably right. It’s only because of the exponential impacts of the industrial revolution and our exploding population that global warming is now an unparalleled crisis. People may have feared forces of nature in the 1800s but they didn’t fear ‘the environment,’ much less their effect on it. They didn’t need to. 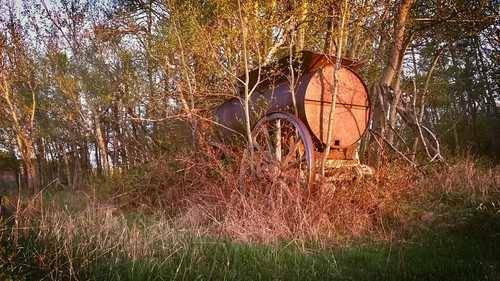 Nature has largely reclaimed the ghost town of Murraydale, like so many others in Saskatchewan. I wondered how many guesses it would have taken me a year ago to predict I’d spend the early days of Spring in Maple Creek Saskatchewan talking about Svente Arrhenius and environmental philosophy with an ex-rancher. When Shane and Frodo dropped me off back at the Redwood Inn, I felt a renewed sense of purpose; to bring just a tiny slice of Shane’s wisdom with me to Parliament Hill. To challenge the government to hear the word ‘environment’ for what it really means: life. Nothing was open in Piapot, but a resident offered water. I was sorry to leave Maple Creek but, by the time I merged back onto the Trans-Canada it felt like the right time. The day was hot, and I quickly went through my 3 bottles of water en route to my small stop-over of Tompkins. Not to worry; another small town, Piapot, was halfway, I had learned. The small road into Piapot was paved…as if it had been paved and repaved 100 times without ever being flat to begin with. Regardless, I managed to stay in the saddle all the way till the local saloon. If one business was open, I thought, this would be it. I wasn’t anticipating the sweet taste of a chilled Pilsner (remembering Shane’s advice) when I realized the door was locked. The windows boarded-up. A few moments later, someone came out, but only to reveal renovations ongoing inside. I asked if there was anywhere in town to get water and was referred to a coin-operated pump on the other side of town. Luckily I didn’t have to walk that far. While photographing some old pickups, a barking dog brought out a neighbour. “Can I help you?” Her tone quickly changed when she realized my predicament. The woman disappeared back into her home and reappeared with a veritable armful of chilled water in various bottles. I graciously accepted a couple and receded the shade of the local park while rehydrating and munching down some packed snacks. 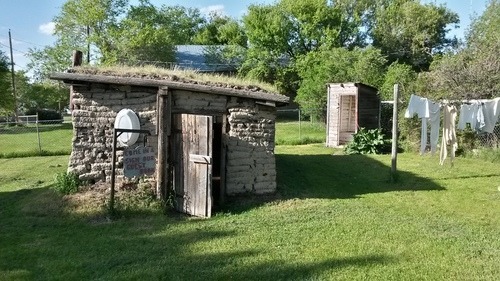 A neat little clay hut invites visitors in Piapot, SK. My detour to Piapot wasn’t without merit. Besides the donated water, the tiny town of contrasting dusty red roads and rustling elm trees was beautiful in its own right. 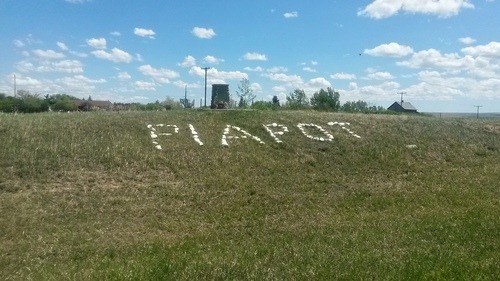 I later learned the significance of its moniker; while most Saskatchewan towns (even ones on reserve) seem to be named for British colonial leaders, Payipwat was a Cree warrior and chief who negotiated vigilantly on behalf of his people in conference with Canadian treaty commissioner William J. Christie and others. The old town in Tompkins was pretty desolate but a diner hidden in the highway gas-stop was good place for cheap grub. My next destination was Tompkins; I wasn’t sure what to expect beyond ‘not much,’ but I knew there was a municipal campground on the way into town. The campground was as described; humble, quiet, if a tad overpriced. My first choice for a spot turned out to be a veritable breeding ground for mosquitos, so I circled back around to a drier, open section and setup camp in between twitchy dances of paranoid mosquito-whacking. After donning long pants and shirt, I braved the outside world to explore the town…only, I didn’t know exactly where the ‘town’ was. There were no ‘city centre’ signs here, just a lot of wide residential lanes of crumbling cement, with weeds and wildflowers playfully peeking out the myriad of cracks in the road. Humble houses clustered in the centre, and windswept trees marked the borders of town, beyond which flat plains of more cement bled into dry fields and railway tracks. I eventually found the ‘main drag’ but it was clear the local business community wasn’t doing as well as the abundant greenery. Of the dozen storefronts, only Woody’s Tavern was open, and there the kitchen wasn’t running. For dinner, I was guided back to the Co-Op station I’d passed on the highway; I hadn’t recalled seeing a restaurant there but apparently there was one. The extra trek back to the highway was as good a way to spend the remainder of my evening as any; luckily it was becoming clear by this point that my left shin-splint wouldn’t require the level of attention as its predecessor, and it was already beginning to heal. Approaching the gas station, I still didn’t see any mention of a restaurant; just when I was worried I might be eating a tired, saran-wrapped, gas station sub for dinner, I noticed the silhouettes of a few folks eating behind some venetian blinds. Ell’s diner was hidden neatly in a humble room at the edge of the gas station, accessible through a secret door in the entrance to the public washrooms. A burger-and-hot-dog kind of diner, I was happy to find a few accidentally-vegetarian alternatives. I ordered a fried egg sandwich and piled my plate high with sides; with coffee, the bill came in under $7. The best part, though, was the waiter, who distractedly sang songs from Spongebob Squarepants and Willy Wonka and the Chocolate Factory in between taking playful jabs at regulars. I returned to Ell’s the following morning for a Pancake breakfast that I couldn’t finish before hitting the road again, now armed with bug spray from the gas station next door. The beaming sunshine wasn’t so overbearing now, but partly, I realized, because of a rising wind…and not an Easterly one, this time. Crosswinds and headwinds made the modest 24km to Gull Lake a grueling exercise in trying to hold my line on the shoulder, leaning into the wind and forcing down each pedal with conscious conviction only to find myself creeping forward at barely a pedestrian’s pace. A few times I had to give in to the wind’s battering, but each time I got off I found it harder to free mount again into the wind. For the first time since leaving BC, I ended up walking a good chunk of the route. Any hope of pushing on to Swift Current was dashed. And so it was that, three days after making a personal record for daily length, I unsatisfactorily concluded the shortest ride of my journey thus far. Strong head-winds made for my shortest day yet, a mere 24km to Gull Lake. 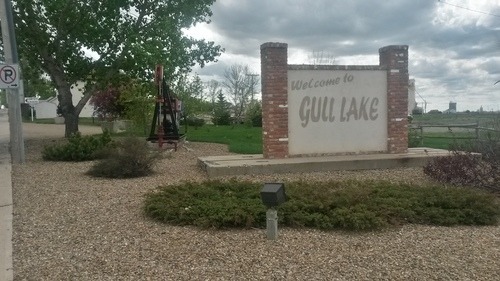 The turn-off for Gull Lake is almost disguised by a run of billboards for Swift Current attractions. The road was narrow enough that I had to walk until a sidewalk emerged, leading towards a helpful map of the town. Gull Lake, like Grassy Lake before it, carries a misleading name; there has been no lake for years. More distinctive is the town’s position on a small hill overlooking the highway and many fields below. After the initial entrance, the roads are broad; some lined with trees and well-kept homes, others bare except for simple businesses. 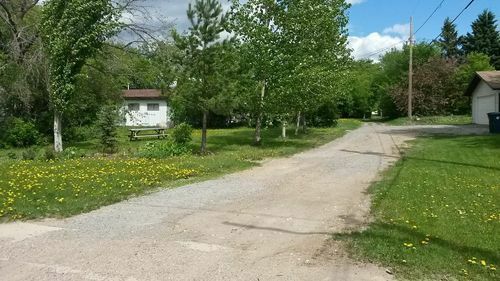 The local campground is located a few blocks West of town in a residential area. I started to fill out a self-registration card by the office when two camp hosts drove up. They were curious about my one-wheeled contraption and the discussion quickly turned to politics. While it was quickly clear we didn’t agree on all fronts, there was no hint of disrespect for environmental causes, much less climate denialism. I was reminded, as I often am when talking to right-wing voters, that a void has been left by the Reform/Alliance marriage that we now call the Conservative Party of Canada. People who are both fiscally and environmentally conservative; who value sound, cautious, scientific land use and preservation every bit as much as social and financial prudency. While certain Green and independent candidates are aligned with this thinking, there’s no chance in sight of a party forming government who’s philosophy is rooted in these beliefs. It’s one of the main reasons I feel the need to be as non-partisan as possible; to recognize that even among big-C Conservatives, there is plenty of justified dissatisfaction at the lack of environmental foresight. 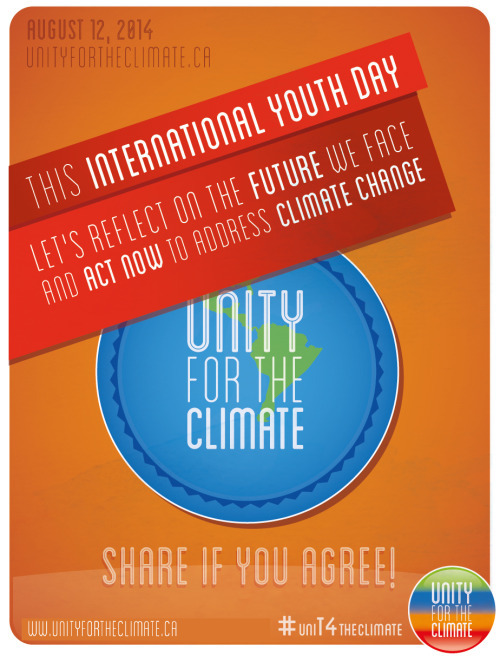 Especially climate change knows no ‘right’ or ‘left’; it is an overreaching crisis that is based in fact and demands leadership that is motivated likewise by fact, regardless of political persuasions. After politics, I retreated to the other end of the campsite to setup my tent, showered, then headed into town for a Fish _ Chip dinner at the Cedar Restaurant. 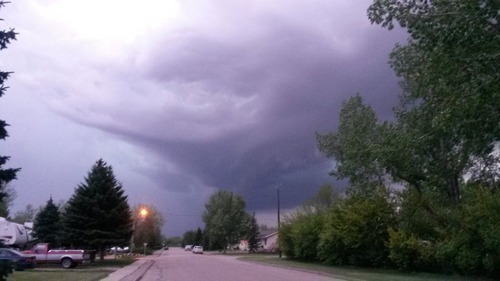 A tornado-watch was issued for Gull Lake that night. Luckily none touched down in the immediate area. By the time I returned, the blustery sunshine was disappearing into cold winds and spitting rain. Gray clouds folded away to reveal dark blue ones that seemed to sink and curdle. As the rain picked up, thunder echoed from the sky and broad beams of flash lightening bounced between the clouds. I receded into my tent. Darkness fell and a few moments later two car headlights beamed through the translucent walls of my tent. I poke my head out and was greeted by one of the camp hosts who asked me if I knew what to do if a tornado hit. There was a warning for the area. Admittedly knowing nothing about tornados, I guessed that hiding in the bathrooms might be the safest bet. “On the floor beside the toilet,” the man said. I guessed this might be handy for a few reasons, should such horrific events actually unfold. Lightning and thunder started well before sundown and brought hail and rainstorms long into the night. No tornados touched down that night, but I did at one point venture out to entrance of the bathrooms simply to marvel at the invigorating might and spirit of the storm. I’ve seen closer fork lightning and louder thunder, but not before been surrounded 360-degrees by clouds so heavy and momentous, lightning so frequent and broad it was is if the paparazzi had not only found the gods but also a way to rival them in size. The downpour intensified, blanketing the ground in a network of new puddles. Then raindrops became hearty chunks of hail that pounded on the tin roof of the washrooms with relentless, ear-splitting ferocity. My tent still out in the elements, I worried that the combination of hail, wind and rain could crumple it flat. Luckily the worst of the storm passed over the campground and I returned to my tent to find it muddy and covered in leaves and branches but perfectly fine. I fell asleep, eventually, with the sound of thunder splitting through ever-more distant skies. The ride to Swift Current was much more successful, with a light tailwind. Lots of friendly cyclists were on the highway, including a fellow who had zoomed East from Vancouver in just over a week while completing Masters courses online and maintaining a diet of pure fruits and vegetables (mostly raw). 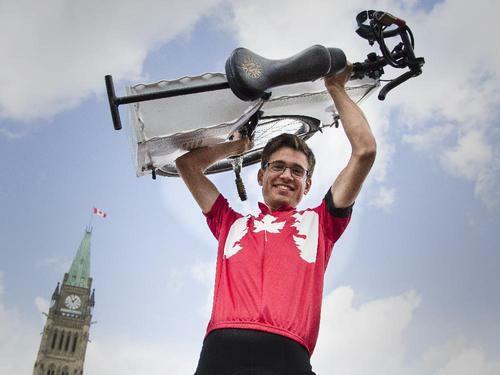 He took a video clip of me to share with his network of cycling enthusiasts from his hometown of Halifax. 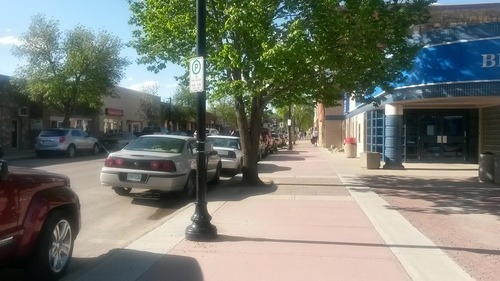 Arriving in downtown Swift Current, I moseyed up Central Avenue North, stopping in the dutch bakery for savoury snacks and ending up at Urban Ground coffee shop, where the owner’s mother (a fellow cycling enthusiast) paid for my iced Americano. The shade and quiet of the coffee shop was refreshing, to say the least, but I was beckoned back out to further explore the many, clustered, welcoming blocks of small businesses in occupying the old brick buildings that clearly identified the south end of town as the heritage section. After some more exploration, I checked a map for local accommodations, hoping there might be a hostel in town. After the previous day’s thunder storm, camping didn’t seem quite as appealing as it might have otherwise; the fact that I’d have to backtrack through the industrial end of town and cross the highway didn’t add to the allure. Instead I opted to walk North through the rest of town and find a cheap hotel on the East side of town, giving me a chance to dry out my gear and ensuring a quick and easy start the next morning. Better weather in Swift Current. A hot shower at the tacky-but-tidy Safari Motel was exactly what I needed; almost worth the price of admission. Cheaping out on laundry, I washed everything by hand and splayed it around the already-warm room. Hockey on TV while chomping down a veggie sub concluded the day in relative luxury. I arranged to meet a reporter with the Southwest Booster the next morning as I hit the road for Herbert and then Morse. There wasn’t much open in the little crossroads at the centre of Herbert, a small farming community beyond quiet. A little concerned about what would be available in Morse, I asked the cashier at the local general store, who reassured me that there were ‘all the same things.’ His other remark about Morse was to be prepared for people parking in the middle of the road. Herbert and Morse would be a lot busier if there were more touring unicyclists. 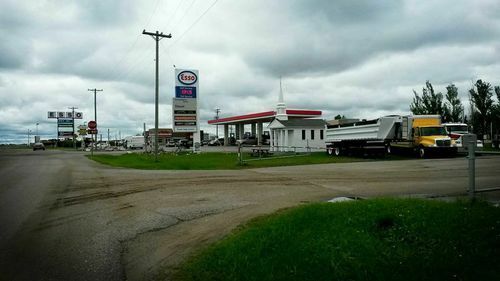 The main drag in Morse is just a short field off the highway but roundabout dirt road takes you past a gas station first; an expanse seemingly inspired by that of the field separated the buildings on either side of the street once my wheel hit cement again. The almost deserted road is wide enough for five lanes of traffic so it’s no wonder people park in the middle of it. The few people scattered between the tired business fronts were, in contrast, chipper and friendly. Their welcoming gestures overcame any curiosity or cynicism they had for my chosen method of transportation. Barely-legible roadside signs looked as if they hadn’t been touched since installation in the 70s; one to discourage door-to-door salespeople and another to guide travelers to the municipal campground. 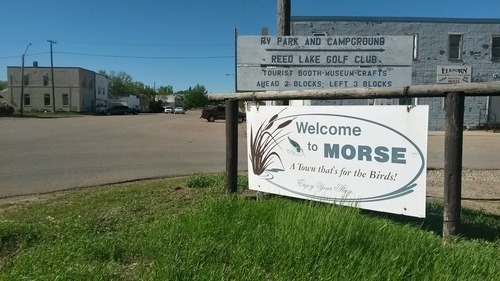 Morse: A town that’s for the birds. Also, a town where people park in the middle of the world. Luckily the campground itself was more actively maintained. 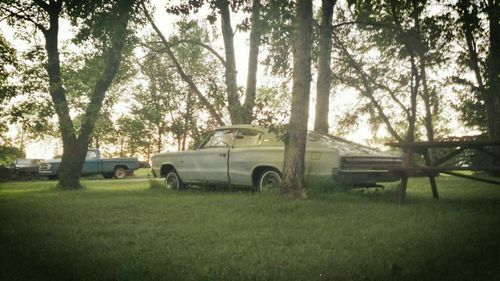 A sparsely treed area where only the pesky whine of nearby mosquitos and the occasional roaring train detracted from a surprising peace and quiet, a mere block from town and less than a mile from the highway. I was the only person there when I arrived and filled out a self-registration card. About an hour later a red van appeared and the driver hopped out. “What’s with this campsite, man?” he asked me. He wanted to get my opinion; if he didn’t pay would he be busted? The poor guy was carting his family via van and tent across the country for work. I answered as truthfully and pragmatically as I could. The van proceeded to drive around the campsite for what seemed like dozens of times before I realized there wasn’t one van, but three. By the time night fell, I was surrounded by campers; if the noise level increased, I was too tired to let it keep me from sleeping. In the morning I got breakfast at the Morse Café and was informed that someone from the gas station had covered my tab. Having never set foot in the gas station, I was a little taken aback. I stopped in at the Co-Op on my way back to the highway to thank my sponsor, who had seen me ride in after hearing about my journey on the news. More snow? 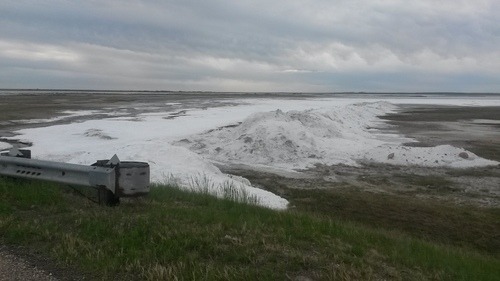 Nope, just salt deposits outside the village of Chaplin, SK, just west of Moose Jaw. A pesky array of merges and off-ramps soon indicated that I was on the outskirts of Moose Jaw. Doing my best at wobbly shoulder-checks and clear hand-signals, I made it past the first few diversions before being forced up the shoulder of the Main St. exit. It wasn’t long before I had to dismount for a traffic light, and although there were trails for another few blocks, they included plenty of unintended speed bumps of warped and collapsed cement. The upshot of the route was, after half an hour of walking, I descended over the last crest and found myself in the centre of old town. I gave up looking for an independent coffee shop before long, and dragged my sopping wet figure into the first Tim Hortons I passed. The fluctuating weather had returned to another brief intermission of windy sun, but it was still much warmer inside. 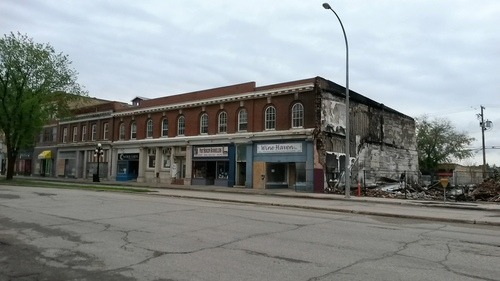 A recent fire leaves the edge of a historic building exposed in downtown Moose Jaw. Unfortunately the momentary luxury only exaggerated my craving for a hot shower and dry bed. I used the wifi at Timmies to confirm that no billet offers had come in, and compare motel prices. I ended up at Capone’s Motor Inn, where I was disappointed to discover the ‘high speed internet’ signal was little more than a mirage. I wandered back to Safeway for a pita and hummus dinner and some fruit for breakfast before receding to my room where the Stanley Cup minus Montreal’s participation put me to sleep in a matter of minutes. Unable to follow-up with local media via email or otherwise check local happenings online, I intended to complete that routine early the next morning. Instead I slept in till 10. By the time I dragged myself out on my ritual coffee hunt and plugged in at Java Express, it was nearly noon. The main newspaper expressed no interest, but I was able to organize meeting with the editor of the free MooseJaw Express paper and Chris of the local Shaw community TV program. My loyal steed waits patiently outside my room in Moose Jaw. Chris did some initial video in town, and I ate up the remaining daylight with some writing, grocery shopping and picking out new insoles for my runners (which ended up costing as much as the shoes themselves, but fingers-crossed seem to have helped prevent more shin splints). As the afternoon wore on I got a call from a Wakamow Valley Park rep who offered me a spot at the River Park Campground for free; Chris had put the bug in her ear and, as he expected, she was all for my climate cause. 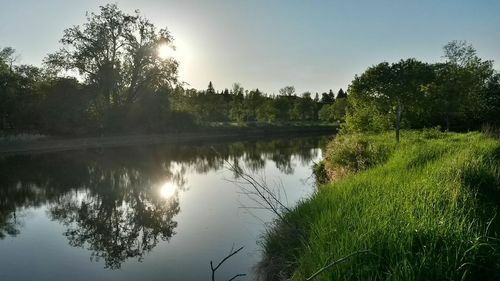 Walking to Wakamow, the Moose Jaw river cut off the urban edges of the city with the definition of a razor blade, opening the landscape up into a beautiful grassy park that wound along the waterfront into an increasingly overgrown and natural abundance of greenery. The scenery at the waterside campground was breathtaking considering its proximity to downtown and it was the perfect breather after a day in the city. Mere blocks from downtown Moose Jaw, Wakamow Valley Park feels a world away. The next day was a damp but spritely ride halfway to Regina. I arrived in Pense in the early afternoon, and would have considered pushing on to Regina had I not encountered a new discomfort in persistent saddle sores; the kind that didn’t go away when I got off the uni, but somehow always managed to feel worse when I got back on. 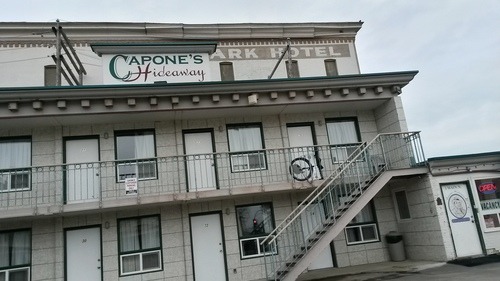 I decided, however, that after such a short ride and expensive two-days in Moose Jaw (despite the generosity of Wakamow), I couldn’t justify paying for the only motel in town. Instead I found a spot where I thought I could safely camp on the sly. Only problem was, the quiet prairie community, marked only by a small gas bar and the other kind of bar, was surprisingly active into the night. Joggers, cyclists, dog-walkers and kids on ATVs ripped through every inch of the greenspace that ran parallel to the business fronts and train tracks. After sitting alone in the local bar with a beer and my laptop for a time, and sitting on a park bench reading for another hour at least, the threat of rain prompted me to risk any unwanted attention and set my tent up anyways. Luckily no one seemed to pay any mind; tents in random places, I realized suddenly, probably don’t have the same negative connotations of homelessness in rural Saskatchewan that they do in my troubled hometown. Cold, damp weather made it easy to get up early the next morning for the quick trek to Regina. It’s not always easy to hide a tent in the prairies. I made it on the highway past the first few exits and merge lanes to the main Albert St. exit, which was narrow enough that I chose to walk. I didn’t get back on the uni until Global News caught up with me for some riding shots on some residential streets. 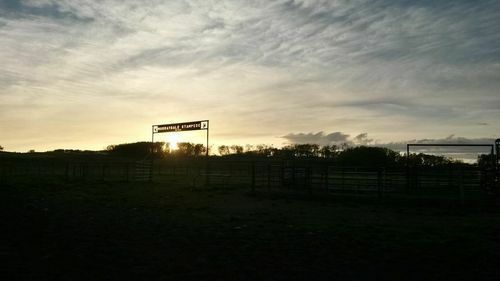 Teri, who had also covered the trip in Lethbridge, had just happened to be reposted at the Regina station, so she was already well familiar with the journey and the quirks associated with filming it. After the shoot I rode back to Albert St. past a highschool just as the bell was ringing. 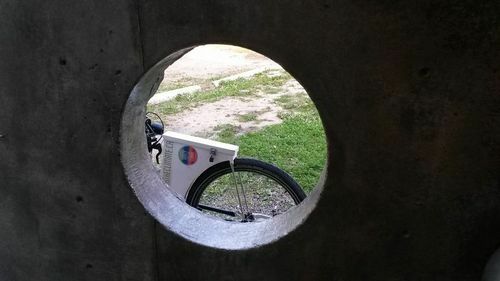 The students called out mockingly for ice cream; a reference to the large white cases bolted to my unicycle. Past the decidedly un-bike friendly big-box, southern suburbs, I was immediately struck by the beauty of downtown Regina; a refreshing mix of pristine parkland surrounding the legislative grounds and the clear, blue Wascana lake and a lively jumble of small business fronts and old residences scattered across tree-lined city streets. The impressive Legislative Assembly in Regina may have the most beautiful surroundings of any in the country. 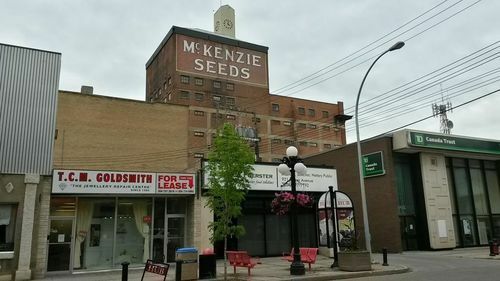 I turned onto the winding Memorial Way which was quiet enough to cycle on and rode past the McKenzie Art Gallery and Legislative Assembly before hopping off again to wander west through the Cathedral neighbourhood to the acclaimed little 13th Avenue Coffee House for a falafel lunch. I still had enough time to wander back to the Leg for an announcement from the provincial Environment Minister who was unveiling a new air monitoring system and region to celebrate Clean Air Day. Environmental activists at the event were skeptical about the value of the initiative, which didn’t address climate-causing pollution and was only concerned with direct impacts to human health. Still, it was good to see some attention paid to that invisible-but-oh-so-important aspect of environmental monitoring and an acknowledgement of World Environment and Clean Air day. I also met Jim Taylor at the event, a generous supporter who would introduce me to many more local activists and advocates the next day. I spent the remainder of the day exploring downtown by foot, ending up back by Wascana Park at the Naked Bean coffee shop to unwind with an iced Americano and catch up on the week’s news. The on-again-off-again weather took a sudden turn for the worse as my Regina billet arrived in town to pick me up. I threw the uni into the back of Patty’s pick-up truck as quickly as I could as a torrential downpour fell suddenly from the sky. 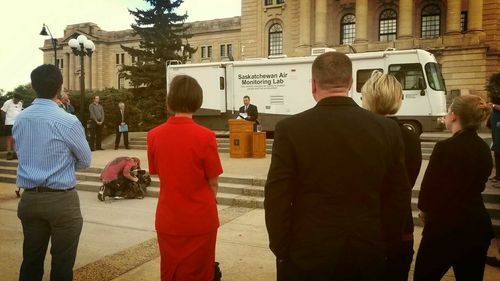 Eavesdropping on a provincial announcement for a Clean Air initiative in Regina. Patty and Cal, friends of friends, had offered to host me in Regina months earlier. Owners and operators of a farm on the Northern edge of town, they didn’t let a demanding work schedule amid an unpredictable planting season stand in the way of their incredible hospitality. Over dinner we discussed the challenges of the climate crisis as it related to food security for a booming population, and how increasing competition made it ever-harder to choose crops according to local demand. On the upside, it was exciting to learn how advances in sustainable fertilization techniques were also allowing farms to seed more crops while turning less dirt, reducing C02 emissions from the fragile carbon sink of the surface soil. (In later conversations, I discovered there’s plenty of environmental controversy around these techniques and technologies, but the prospects for GHG reductions are very promising, indeed). A mock wedding between the Line 9 Pipeline and the city of Regina called attention to the expansive Enbridge project. I had one more full day in Regina. Local activist Jim Taylor (who it seemed everyone knew) had tipped me off about another event of interest, this time at city hall. 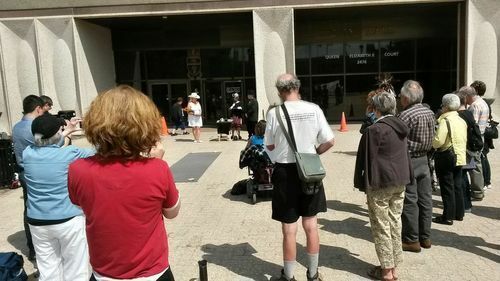 A mock wedding between the oil industry and the city was being performed to protest the Line 9 (‘Energy East’) pipeline; a sprawling, 4,400km combination of converted and new pipeline development proposed to carry crude from the oil sands to the Atlantic coast. The pipeline will pass through numerous wildlife areas and dozens of communities, with startlingly close proximity to cities including Regina, Winnipeg and Quebec. Despite this, the City of Regina didn’t even apply for intervener status in the Energy Board review process, and not a single councillor has taken a stand to recommend a local referendum, much less issue formal opposition on behalf of its residents. The audience was modest but the wedding was a hoot, with the bride and groom awakening rudely to their differences as wedding gifts and vows clashed and the groom, Mr. ‘Ener-G’ spilled his ceremonial black crude all over ‘Regina’s’ white dress. 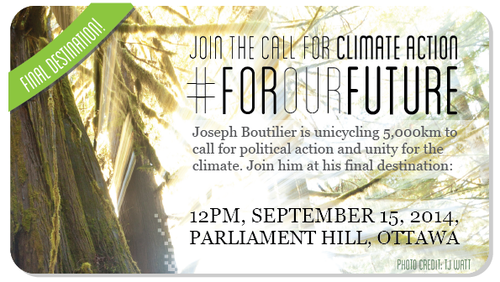 I gave my card to a CTV videographer at the event before meeting more advocates participating in the event, who were following it up with a weekly flyering activity which just happened to be focused on an Energy East education campaign that week. 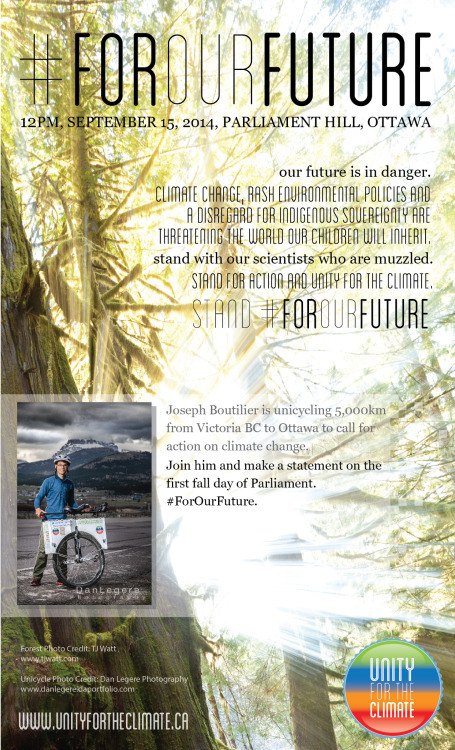 I helped hand out flyers in the public square outside the Cornwall Centre; it was quickly clear the awareness and concern for this project wasn’t nearly as heightened or developed as that for the Northern Gateway on the westcoast, nor the highly polarizing Keystone XL. Still, it didn’t take long to hand out all the flyers and some folks on the receiving end expressed their gratitude for our efforts. I fear it may be too late for Regina as a whole to really come to terms with the ramifications of the project before it gets the final stamp-of-approval; that may be partially because the physical infrastructure there already exists (for Natural Gas), and to be fair, because the city is likely to have more true proponents than for other Canadian pipeline proposals. But to forego a real educational campaign, civic consultation process and referendum is a lost opportunity for all involved. Energy East deserves at least as much scrutiny as any other pipeline aiding the expansion of the unsustainable Athabasca operations while endangering a huge range of communities in the not-so-unlikely case of a spill. 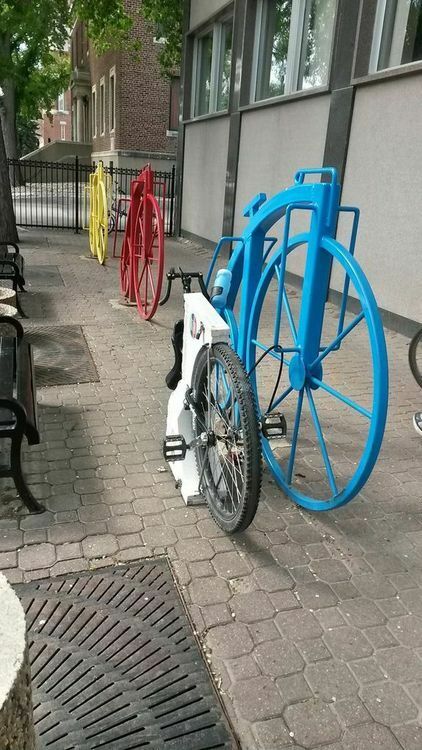 Appropriate bike locks outside the library in downtown Regina. After flyering, the group invited me for lunch at a real, bona fide, vegetarian-speciality café (The Green Spot) and afterwards I still had time to visit the Royal Saskatchewan Museum. Although the native and local history sections were a little disappointed (I’ve been spoiled by the likes of the Natural History Museum in NYC and the surprisingly-robust Royal BC Museum in Victoria), the beautiful nature dioramas and interactive displays clarified my limited understanding of the province’s diverse eco-regions and prepared me for what was to come as I trekked ever-East. I was pleased to see that a sizeable section of the museum was reserved for a no-nonsense introduction to climate change and other very-real global and environmental challenges, plus of course, proposed solutions. These displays were both informative and artistic. This section was complete with warning signs preparing visitors for the depressing-nature of the predictions cited; how many people were too afraid to even look, I wondered? Lots off small towns east off Regina allowed for plenty of breaks on a hot day. Patty drove me back into town to pick up the trek East where I had left off. The walk through downtown took over an hour, but the timing was fortuitous because I passed the CTV station on the East end of town just as the videographer I’d talked to the day before was pulling in. He filmed a short interview segment and set the camera to roll as I awkwardly hopped back on the uni amid powerful gusts of wind. 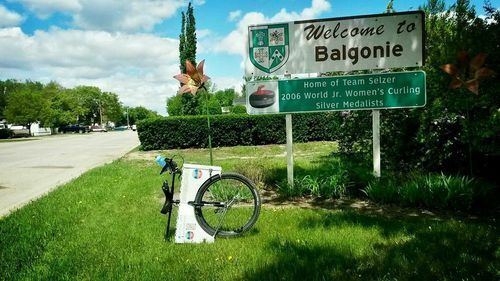 Once I was up and riding, the wind worked to my advantage and the ride to Qu’Appelle was speedy enough, with short breaks outside White City, Balgonie and McLean. A nice quiet park in McLean, SK. The narrow road to Qu’Apelle was fine until I passed under the last railway bridge; just when I was feeling grateful for an underpass instead of the usual bumpy, pitted-wooden overpass, I hit a thick, slimy mud slick and had to hop off in a hurry. The turnoff to the local campground was right there, but I opted to take a pass through town first, which was a few blocks back West. A charming hand-painted rendition of the Roughriders mascot happily looms over the quiet street of heritage buildings and converted pre-fabs. The street was relatively busy; seniors and young families, alike, strolling between the modest assortment of stores. Kids amused themselves by popping curbs on BMX bikes and pestering me to ride for them. I bought some groceries for dinner and breakfast from an old movie-theatre-turned-market before heading back to the campsite. Creekside Gardens is a private campsite but not of the usual empty-field with gravel-driveways variety. It’s small, but lovingly maintained, surrounded by cheerful gardens and vibrant greenery. I was surprised to find I was the only tent on the quiet premise. I started to read, then dropped into an accidental nap mid-paragraph. I drifted in and out of sleep all night as trains passed nearby and the wind bullied the edges of my tent. Things got interesting the next day when literal smooth sailing in the easterly winds was rudely interrupted by a small puncture, which turned out to be only the beginning of 3 straight days of baffling mechanical frustrations. Luckily, it all happened just 10km west of one of the friendliest towns on my journey thus far. With only moderate headwinds and a relatively generous shoulder, the labour of my gradual advance seemed, as if often does, increasingly exaggerated. I didn’t think much of it at first. If physical exhaustion or mental drowsiness causes me to sway, wobble or lose my balance before the inevitable crotch and back pains cause me to dismount, I know it’s time for a break. I’ve learned the hard way that ignoring these warning signs never ends well. So, as the kilometers ticked by and balance became extraneous, I pulled over at the first cross-road and went through the motions of my usual breather; removed my backpack, topped up the water on my handle bars from the bottle in luggage, and popped a few peanuts in my mouth. A couple minutes later I went to remount and discovered, only then, that something wasn’t quite right. The same sense of imbalance that had caused me fatigue while riding was now making it nearly impossible to mount. Perhaps, I figured, the mottled pavement was more uneven than it appeared; a trick of the light. I walked a few meters more and tried again. It was then that I began to suspect that I’d finally acquired my first ‘flat tire’, although the tire, at this point, was far from collapsed. In fact, the change in tire pressure was hardly discernable, as was a a hiss, so faint in the distant dialogue of traffic that I wasn’t convinced of it at all. Nonetheless, it made me wonder enough to play it safe and simply walk the uni a further half-kilometer. Over this distant, it became increasingly evident that my fears were correct. The air that I’d be resting on for the past 2,000km or so was finally escaping back into the atmosphere to be blown across the prairies. Fair enough. I’d been lucky for so long. I rested the uni on its back case and briefly considered roadside repairs, but by now I was well past the best pullouts, and I immediately recognized that one of the bolts holding the wheel on was already near stripped; if it got stuck halfway, both walking and riding to the next town could be equally problematic. After consulting Google Maps, I opted to walk the last 8km to Wolseley, where I would fix the flat from the comfort of the Leland Hotel, which roadside ads had pegged at $50 per night. The leak was slow enough that I only had to re-inflate the tire a couple times to avoid running the bare rim over the imperfections of the shoulder. I flew through Indian Head before a flat caught me off guard outside of Wolseley. After checking in at the quiet bar below the Leland rooms, I started back outside to drag my maimed steed up to my 2nd-story quarters. I was stopped by Eleanor; a local reporter who had heard about me from her relations at the Stone’s Throw Café in Blairemore Alberta, where I’d spent a week recovering from my first shin splint. After a quick chat and photo, she offered her card and promised to put me in touch with local DIYers if the wheel gave me any trouble. I thanked her and carefully stowed the card, although I was optimistic I wouldn’t need it. How wrong I was! That suspect bolt, indeed, seemed downright eager to lose its limited Allen key grooves as I struggled with my miniature tool-set to break it loose of its lock-tight-reinforced nesting place. Eventually I had the bright idea of gaining more torque by detaching the rear bar from my uni and fitting it over the short stub of a hex key I had. This worked to gain torque, which in turn only smoothed out the receding grooves of the bolt without turning it more than a half-rotation. Darn. I then tried gripping the exterior of the bolt with my adjustable wrench paired with all kinds of cloth and rubber sleeves. When that didn’t work I bothered the management of the hotel to borrow a pair of pliers from their handyman’s closet. Nope. At this point, I’d been messing around with this first of the four bolts securing the wheel for the better part of three hours. The evening was wearing on and I decided to grab a bite to eat in the bar before the kitchen closed. I’d go back to the uni after. The bar and hotel – run by an West Indian family – just happened to have an Indian dinner special every Saturday. This (which was generous and delicious) combined with a cold beer and a Stanley Cup game kept me in reasonable spirits. As fortune had it, the game was the only one of the series to run into double overtime; just the excuse I needed to procrastinate on my mechanical woes till well past my bedtime. The next morning didn’t provide any new insight or inspiration; tinkering got me nowhere. It was time to call Eleanour. Although she, and it seemed, everyone in town, were preoccupied with church (it being Sunday morning after all), I arranged to meet her later that afternoon when she would take me to a retired South-African school teacher-turned-bike-mechanic down the road. In his garage, with the aid of a vice grip, the bothersome bolt finally gave up its stubborn opposition and pried loose. I was so preoccupied, at this point, with being as little a bother as possible, that I aided in rapidly removing the wheel and fitting a new tube, forgetting something that I had been reminding myself to do since the flat occurred; to check the tire and rim for sharp objects. Indeed, in this way, we unknowingly sacrificed my spare tube to a tiny fragment of rusty metal wire, probably traded from a shredded 18 wheeler tire into my own, tread-worn knobby. I wouldn’t discover this, of course, until me and the uni were back on the street. The one benefit of all this was that I had traded the stripped bolt for a new one, and was confident now I could make further changes unaided. The sun set in Wolseley before my mechanical troubles were solved. The bad news was, by the time I realized I had another flat, the evening sun was descending and it was clear I wouldn’t be going anywhere for at least one more night. While grumpily pushing my half-flat-tired uni around town contemplating where to stay, I came across a couple out for an evening walk. David and Helen had seen me on CTV Regina and within seconds of casual conversation, David was directing me back to his garage so at least I could get the tube seen to before retreating to the mosquito-utopia which was the local campground. One thing led to another, and soon Dave was urging me to let him drive me back to Regina to get a new tube so I wouldn’t have to rely on my patch kit; Sunday evening was hardly a time to hit up specialty bike shops but there was a reasonable chance that Canadian Tire would have a 29” Schrader tube and we could get there before it closed. Reluctantly and gratefully, I conceded David’s plan made sense, and back to Regina we went. Long story short, an extended tour of closing Canadian Tire, Sportcheck and Walmart outlets netted us an emergency backup of a 29” Presta tube and – the real gem – the last 29” Schrader tube in the largest Canadian Tire store in Western Canada. Bingo! This time, I found and removed the puncture-popping wire culprit before replacing the second tube of the day, and patched the wounded victim as an alternative to my less-than-ideal Presta backup. As if aking the hour-run commute back to Regina wasn’t enough, David insisted on covering one of the tubes, and Helen and he invited me in for dinner. Tire topped up with air, myself with good food, Uni and I were ready for a good night’s sleep at the campground down the road. Despite the proliferation of mosquitos, the desolate surroundings of abandoned cars, the strange absence of showers and the slightly-eerie sound of newscasts echoing up from a bunker beneath the bathrooms, Sleepy Hollow was genuinely a peaceful spot and I got plenty of rest as I mentally prepared to hit the road again. Somewhat eerie campground in Wolseley, complete with hidden bunker. Several adjustments (and a change of wind direction) were required before I could ride again. That test about riding before Grenfell? I failed it. After a grueling and defeating walk the rest of the way to the first motel I came across, I did my best to push the whole problem out of my mind and resigned myself to sleep regardless of the day ahead. The next morning, the sky was calm and cheerful, and I found very near the motel a street that was wide and quiet. These conditions begged me to give the unicycle one last try; after inflating the tire again ‘one last time’, I mounted almost effortlessly and was surprised by my ability to ride a few meters with ease. After a few more adjustments to the PSI, it felt almost natural. I breathed a sigh of relief. Indeed, the direction of the warn tread and, even more so, the difference of a couple extra pumps was all it took to restore ‘the balance’. In a way, it had been me after all; there was nothing wrong with the unicycle except my own ignorance, after some two months, of the dramatic impact of a few fragile tweaks. I rode quickly to Whitewood; a mid-size town by small-town standards, encompassing a modest range of small businesses freshly painted and maintained, all on paved roads no-less. 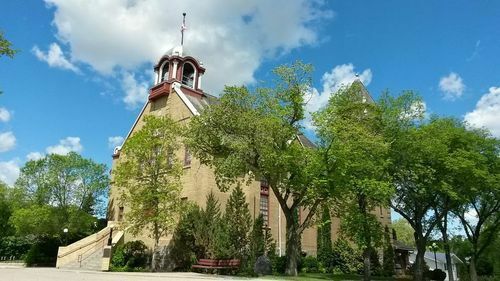 An old town hall and church buildings lent the town an heir of heritage, while its proximity to the highway and a few small franchises keeps it a practical service community. I stayed a municipal campground that doubles as a baseball park, conveniently located just a couple blocks from downtown, where I was finally able to mail a package back home that I’d been carting around since Regina and then grab a coffee and pastry at Dragonfly Coffee shop, a gem hidden in plain site under the local grocer’s dominant banner. After finishing some writing, I stocked up on food for dinner, breakfast and the road ahead, ate at the campground and fell asleep to the sounds of a flurry of excited junior-league baseball games. 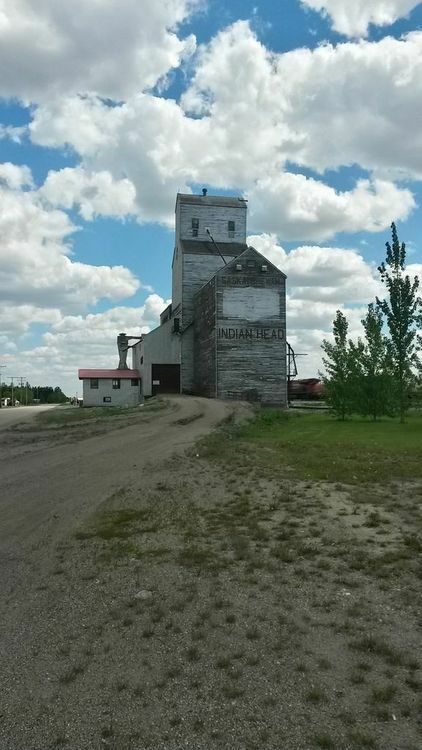 The next day was an even longer ride, through the tiny town of Wapella to my last major stop in the prairie province, Moosomin. 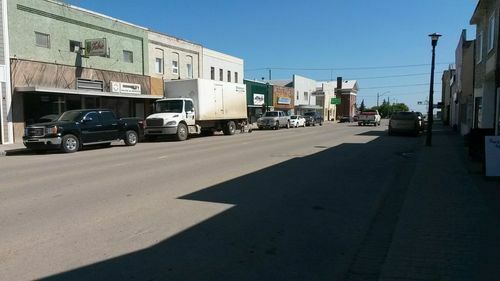 Wobbling into Wapella, a Chevy Impalla turned around to follow me to my stop outside the three storefronts and grain elevator that denoted downtown. An old man rolled down the window and expressed, with an expressionless face, how impressed he was with my method of transportation. When he asked about my cause he surmised, perhaps with some disappointment, “I guess you’re against this pipeline, then.” I told him in as many words that I was, but he graciously extended me a $20 donation despite our contrasting views. Another friendly local directed me to the only place in town I might find food; the community hall not three meters away. I was a little uncertain I was walking in the right doorway until a voice echoed across the barren, old wooden room: “Lunch?” I said yes, and that was it. No menu was necessary here; lunch was what it was. For $7 I was served coffee, mashed potatoes, corn, green beans and sausage. It was one of few occasions I succumbed to the convenience of eating red meat (a former and most-often vegetarian), spurred by a combination of appreciation for the humble but nourishing simplicity of the meal and a raw hunger that egged me on. I was a little distressed by just how good the sausage was, as it made it all the harder to ignore the flavours I missed since childhood. The meal, and the company off seniors, reminded me of something I might have enjoyed as a child at my grandparents house or a community tearoom. Now that’s what I call comfort food. 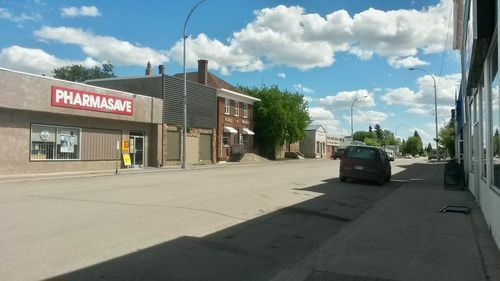 I continued on to Moosomin without much fuss, and was overtaken by a craving for a good cup of iced coffee before hunting down the nearby Fieldstone Campground where I’d been offered a free night. 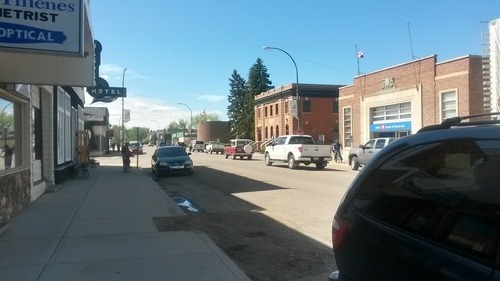 I suspected Moosomin was big enough to have an independent café or two, and with what I suspected would be my last burst of energy before a coffee break, I decided to cycle past the usual border temptations to find such a spot. I was intrigued by a large number of bikes stacked up outside Dairy Queen, and hesitated before cycling on, past a small jumble of active industrial shops and bustling drive-throughs, restaurants and motels. Not sure where I was going, I turned right at a stop sign halfway along this strip simply because it was the only way I could safely go without stopping. Up a short hill, it soon became clear I’d happened across the original town road that anchored historic Moosomin onto the modern highway. Train tracks lay like a superficial border between the old and new; after crossing them and rolling slowly past a tidy aisle of timeless small businesses, I noticed Witch’s Brew Coffee on the other side of the road. Amid boxy hardware stores, pharmacies and the grocers, its playul sidewalk sandwich board and large windows weren’t hard to notice. I ordered my iced coffee and made myself comfortable next to an AC port with my phone and laptop charging. I was feeling a bit guilty for passing by fellow cycle explorers in the name of stronger coffee, like an antisocial snob, when the very same bikes appeared outside and a half-dozen girls doubled the occupancy of the quiet coffee shop. 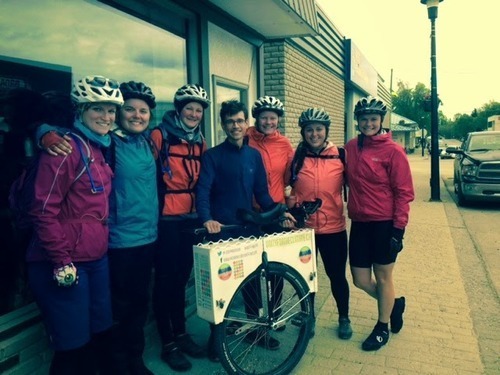 A half-dozen cyclists tracked me down to Witch’s Brew Coffee in Moosomin. Danica had vowed to cross Canada before the age of 25, and rallied a few friends into joining her on the trek from Vancouver to St. John’s. Like many cyclists before them, they’d been tortured by drawn-out and no doubt exaggerated tales of my glacial trek through the mountains of BC, my fabled shin splints and my daring battles against a bit of wind and rain. They were anticipating the day when they’d finally trivialize my efforts by racing several days ahead of me in a matter of hours (but in a nice way, they assured me), and when they saw me pass by DQ they knew they had to hunt me down. They suspected I’d gone to Tim Hortons, but upon phoning a confused Timmies employee who eventually confirmed that there was, indeed, no unicycle parked outside their establishment, they knew there was only one last place to look (boy am I predictable). It was obvious from our brief and animated conversation that these girls knew how to make the best of every situation and were having a blast, despite the usual troubles that join any excursion of such magnitude. We also talked about how facing such challenges is perhaps the best way to see the best in others, as all of us had been helped graciously and unreservedly when we needed it most. The gang invited me to join them at their Virden campsite later that night, but I didn’t think I’d make the extra miles before sundown. We exchanged blogs and said our farewells, and as they raced ahead towards their East Coast destination, I tapped out a couple emails, got groceries, and then made my way to Fieldstone. The scenery changed dramatically in the miles proceeding the Manitoba border. The campsite was great, although the mosquitos were prolific, and I was unusually grateful for the wind on the highway when I hit the road the next morning. I also stopped in for a chat with the Moosomin World Spectator in its new digs on Main St. The converted bank was stunningly open, airy and modern; a far cry from the usual modest office of a local paper. I only learned then that the World Spectator is the oldest paper in Saskatchewan, going all the way back to 1884, as evidenced by a small collection of original proofs and other memorabilia now stowed away in the inherited safe. A brief stop for lunch in Elkhorn before making for Virden. 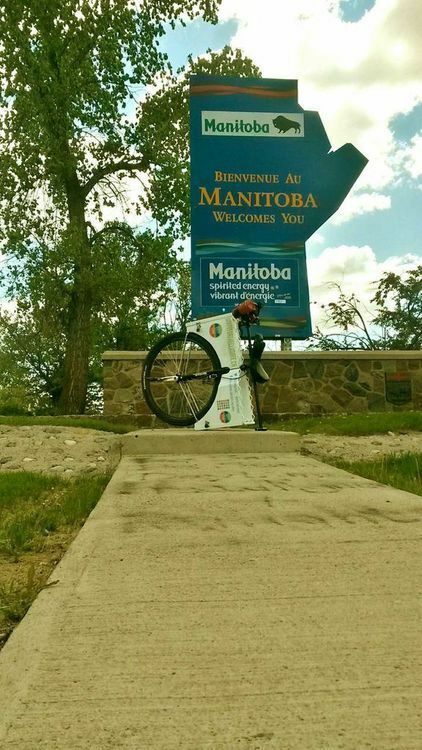 I soon found myself crossing the border into Manitoba, with a stop at the visitor’s centre for a cup of free coffee and a guide book to rural accommodations. Almost instantly, shrubbery and gentle slopes were stirred into the prairie terrain of bright, vast farmland. I was happy to see that the shoulders of the road remained paved (at least for the time being) and the province’s infamous highways were more than acceptable at its Western edge. In Virden, I settled down in the Lions campground a few blocks from town. 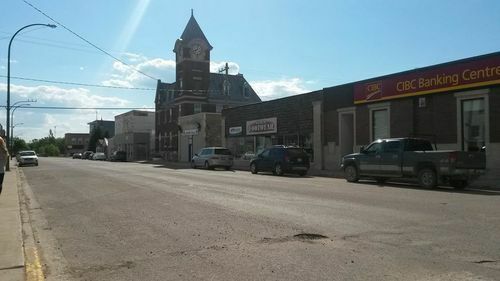 Unlike so many towns, the sparse entry highway into downtown Virden hasn’t exploded into commercial sprawl, and as a result, the old downtown area is every bit as viable and vibrant as ever. Welcoming residential neighbourhoods surround the town, with enough pockets of urban greenery to keep the quiet, country vibe alive amid even downtown traffic. I was most impressed, though, with Victoria Park; although occupying only a few blocks, the greenspace combines forested shade, landscaped gardens and even a small pavilion just blocks from downtown. The next day, after wandering around aimlessly I finally found the obligatory local coffee house. At Gopher Creek Coffee Company, not only did I find great coffee and the most delicious breakfast sandwich I’ve had on the road, but also great company. The owners introduced me to a photographer and gave me some tips on the local media, and wouldn’t take any dough for the grub. From there I met a local TV reporter who filmed a short segment as I left town for the mighty Brandon amid what would turn out to be the last dry weather I would see for some time. Little did I know that within weeks, all of this land would be facing a state of emergency for record rainstorms and the potential of a chain reaction of dangerous flash floods. Rain was falling by the buckets-full by the time I made the turnoff from the roar of mainstream traffic continuing on the TransCanada bypass over Brandon to the city centre route. I didn’t find out till after I’d made the turn-off that this winding, rural route was undergoing major construction. The rain quickly rendered my raingear nothing more than heavy layers of spongy, wet, chill and shrouded my glasses in droplets and fog, while the construction meant the shoulders of the narrow roads were freshly chewed up and stirred; like a Pillsbury instant-mix for vast mud puddles, grabby clay-coated rocks and eroding gravel dikes. Add to all this giant rivets of packed dirt laid out by the giant tread of some lumbering construction vehicle, forming something like the curves of a massive washboard over the edge of the road, and there was no way to ride even an inch of the stuff. Having ridden more than 70km already (itself roughly twice my daily average), my heart sank as I realized the construction was also forcing traffic back West in a lengthy detour. When a driver stopped and offered me a ride into downtown, sopping wet, muddy boots, uni and all, I made the rare exception and thankfully took them up on the offer, and made up the extra kilometers circling the city the next day where the roads were level and mostly paved. Downtown Brandon was surprisingly quiet. I stayed in a motel at the North end of the city that first night, regaining feeling to my numb limbs in a hot a shower before venturing out again for a fast-food dinner and an early night. My initial impressions of the town, honestly, were not so warm, but a respite from the downpour allowed me the next day to explore with a fresh perspective. I was initially confused when I rode South again, expecting this main route to converge into crowded downtown streets, but instead found myself in a vast outlying neighbourhood that offered no clues as to where the heart of the city might lie. Eventually I found the iconic stone gateway announcing the route into town, although even here, the surrounding houses and greenery obscured even tallest buildings in the old area. The original downtown was oddly quiet; although it had all the makings of a thriving heritage district, with distinct industrial buildings from centuries past opposite modern malls and quirky storefronts, there were few people and even fewer cars. Over the silence, the sound of trains crawling by along the ravine below the old brick and cement walls of the city competed only with the distant hum of highway traffic. And my routine quest for a local coffee shop turned up dry, with Google maps leading me deceivingly to nothing but closed restaurants and a Tim Hortons kiosk in the local hospital. Even ubiquitous franchises in this old area of town were spread far apart between derelict buildings and empty lots, and several were likewise closed and abandoned. The crowd of seniors that would, in any other town, be crowding the local A_W or Timmies was uncomfortably alone in an echoing food court, drinking coffee in Styrofoam cups from a Thai restaurant; the only open vendor. 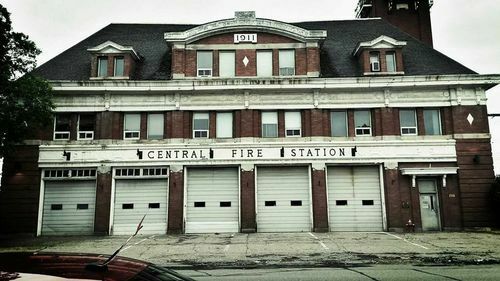 The old fire station in Brandon looking rather neglected. The tones of rust and red brick, the resilient masonry of proud old buildings and the charm of independent ma and pa shops kept old Brandon striking, even intriguing. But in an age of rapid suburban expansion and big-box development, it was clear these quiet blocks were struggling to retain their identity as the vital organs of the swelling city. The library was clearly one reason people had to still gather here; it provided me a place to sit and write for awhile before tenting at an RV campsite on the Trans-Canada North of the city (which, annoyingly, made no price exceptions for unserviced sites). En route, I found more evidence of the city’s outwards-expansion and felt guilty by perpetuating it through a visit to Starbucks for a phone quick-charge and Subways for dinner and to hide from more rain. 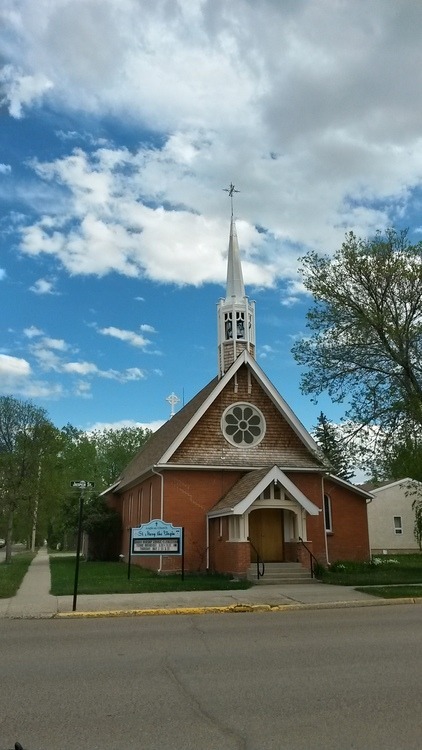 A chapel outside of Brandon is dwarfed by neighbouring trucks. My original schedule had me stopping next in the tiny town of Douglas or somewhere thereabouts. Only problem was, there’s nothing in Douglas except a tiny general store. The small ratty road into highway gave me my first taste of a real hill (albeit short) in weeks. No doubt I was past my daily prime by the time I refueled my coffee cup and bought a saggy pre-packaged Danish at the aforementioned store. I scanned briefly and as inconspicuously as I could for a place to camp incognito but I didn’t feel anymore like foregoing a real dinner or a warm shower than I did pushing through saddle sores for the remainder of the day. 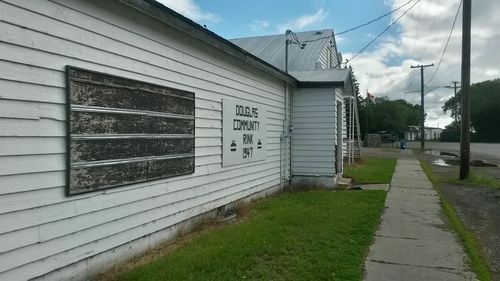 Douglas, MB isn’t exactly a bustling tourist-stop. I ended up in Carberry and didn’t for a second regret my decision. Past a series of old, proud churches and older, taller trees, an eclectic row of stores stood out from the backdrop of tree-lined residential streets in the evening sun and several open signs still glowed invitingly. A cheap-looking motel tempted me, but when I had a soup and salad at a café downtown I was provided directions for municipal campground which was bound to be a wiser buy in the opportune window of great weather. 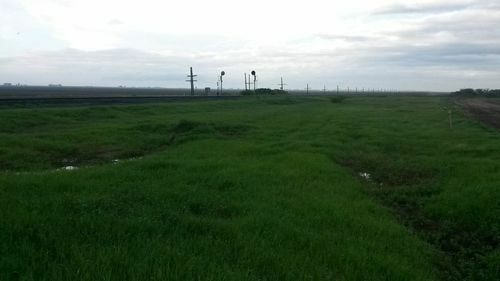 When I arrived at the place – a few blocks from the main strip – I realized that I was lucky to find a spot among the mere 6 sites, 4 of which occupied and the last which would be claimed a few minutes later. I had searched earlier in town for somewhere with wifi or plugs to charge my phone and laptop to no avail, so I was pleased to find both in a little drive-in across the road from the campsite. 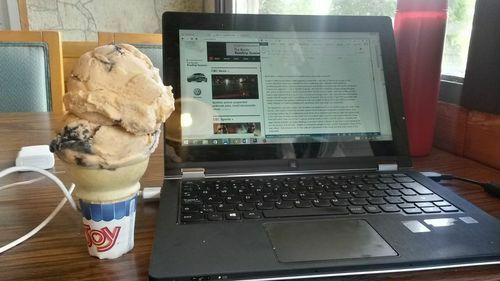 In place of my usual coffee, I took advantage of the Summer Shack’s rare offering of Tiger Tracks ice cream. Because, there’s just not enough black licorice in the world. The next morning I complimented my left overs with hot coffee and toast at Modern Bakery in town before making for MacGregor. 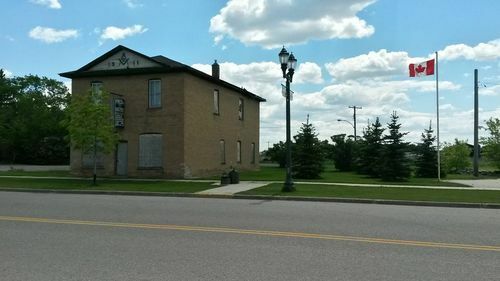 Downtown MacGregor is about a block long, with businesses mostly reserved for one side, with grassy fields and shrubbery abound; even still, there’s no doubting your arrival for the animated character of the place. As I rode in, flurries of cotton fluff blew through the sunny streets and wafted down to disguise street curbs and other hard lines in blurry, soft slopes, melding everything seamlessly together. As people criss-crossed between stores, swung open car doors, suspended shopping bags above the ground, the stuff swept back up into complicated currents and danced off to other gatherings. It was as if a massive pillow-fight had recently occurred on the streets and now the filling was left to tussle through the last battles as people tired and got on with their lives. I stopped in Hampton Café for a fruit smoothie, as I arrived too early for dinner. A mash-up of 60s diner and contemporary coffee shop, the interior was oddly striking and yet fitting for the well-kempt, timeless aesthetics of the town. Inside, the usual coffee-break farmers’ circle was surrounded by other town characters; business people gossiping about local politics, Harley bikers and a spontaneous recipe-trading club of sorts. There was a plug, and yes, even wifi. I was almost reluctant to leave save for an encroaching sleepiness. I asked for directions to the local Lions’ campground and set off to find it, winding down with a leisurely walk. Tiger Tracks ice cream and CBC News. Am I in heaven? A short time later, a girl pulled up beside me on a bike and asked about my journey. After a brief but friendly chat, she confirmed directions to the campsite and sped off. I found the campsite – a simple, rolling field in front of a small forested park – and set up my tent. There was no office or host; payment instructions were provided but no forms nor a place to put them. There was, however, a tiny book exchange in a small wooden cabinet, where I found a pocket-sized copy of HG Wells’ War of the Worlds. I never got into the original movie, and although the Spielberg remake was entertaining enough, I knew it was equally unfaithful to the book. Over the next couple weeks, Wells became my escape and sole source of amusement when my phone and laptop were dormant and discharged. Somehow, the tale of a cruel alien invasion in turn-of-the-century England seemed highly relevant in the face of our plight of self-destruction. While many have suggested Wells was extolling a dramatic metaphor for European colonialism, I saw in the book a sad contemplation of our unsympathetic dominance over nature and assumptions about our unequaled intelligence and supremacy. (Spoiler alert!). In the book, the aliens who demonstrate that same “unkind” dominance ultimately fall victim to their own overconfidence and ambition, not by any virtue of us underdogs’ resistance. In the same way, we cannot expect the first victims of climate change (be they human or otherwise) to have the might to alter our destructive course; we must do so ourselves or peril at our own persistence. Enough about War of the Worlds! I had just set up and reveled in the first chapter of my new find when another cyclist approached me. It was the father of the girl I’d met earlier, who invited me back to their place for dinner. I gratefully accepted and soon found myself at a large family table with a bevy of different dishes to choose from. Him a Mennonite minister, her a Mennonite school teacher; we ended up talking family histories and how intertwined and diverse the background is of even ‘mainstream’ Canadians (if there really is such a thing). Perhaps thanks to my inexplicable knack for steering people towards political discussion, we also talked religious politics. It had occurred to me that this area of the country – like most I’d passed through – was overall more overtly Christian than my hometown, and, I figured, in some sense more unified; Now I got the inside scoop on just how many factions of Christianity existed and the cultural complications and controversies therein. Much like politics, I suppose, far too few are able to look beyond labels and beliefs to see our commonalities. Either that, or they especially embrace labels to define the scope of their communities. I was tempted to question how belief in climate change might be furthering complicating those strange divides, but I was feeling, by that hour, even more docile than usual. I like talking about controversy; I don’t like creating it. I walked back to the campsite through the small park behind it as the sun set and the cotton continued to snow. I was surprised it wasn’t raining, and the wind had died down; the ensuing silence, I admired, had become a thing of rarity. I didn’t realize it at the time but the preceding day of dryness, and its persistence despite threatening skies, was especially blessing given the roads to come. 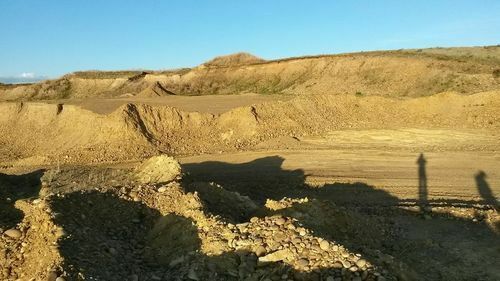 A few miles west of Portage la Prairie, the infamous gravel shoulders of Manitoba reared their ugly crown for the first time. As promised, the bulk of the pavement along the edge of the highway disappeared without logic or apology, leaving in their place a thoughtless mess of dusty, blasted stones and patches of dirty sand. Had it been any wetter, the terrain would have been unrideable. Instead, I was relieved to find that with enough pace and concentration, I was able to barrel over it, even on hills. The price to pay was pace, efficiency and comfort. Overlooking these annoyances, and my anxiety about reaching Portage as planned, the challenge was almost entertaining. 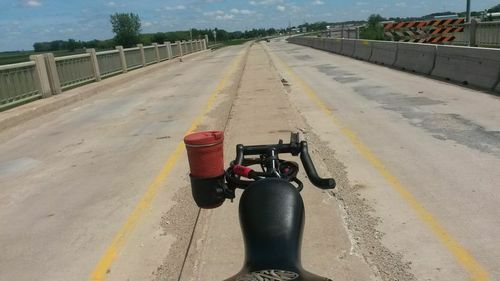 What wasn’t entertaining in the slightest were the increasing number of obstacles that proved – beyond a question of a doubt – that the engineers who approved this portion of the Trans-Canada had a secret (or perhaps blatant) death wish for cyclists. Because the lack of cement just isn’t horrible enough, the Highways department here has eliminated shoulders altogether in several spots. Bridges with shoulders? Screw that! Bridges with one foot of shoulder, then a foot-high curb onto a foot-wide sidewalk that precariously straddles the bulging railings and occasionally crumbles back onto the highway are evidently, preferably dangerous. And then, why reserve this design for bridges? Why not employ the technique anywhere there’s a drop-off or cement barriers? Shoulders on overpasses with construction? Instead, how about a foot-wide curb in the middle of the highway that only serves to remove the space allotted to shoulders, so cyclists have to dismount, cross the highway, mount the centre curb and then straddle the space between traffic in both directions while fighting the ‘extreme crosswinds’ afforded by the altitude? There, that’s better. And in every other construction zone, let’s pile as much signage and needless cones on the shoulder as possible to eliminate any chance that any cyclist, let alone unicyclist, should escape unharmed. Let’s just say the miles outside of Portage la Prairie were not my favourite stretch of the TransCanada. Of course, I don’t really believe that these inconveniences were maliciously designed, but it seemed that they could hardly be more problematic if they were. Having to constantly dismount, of course, also meant having to free-mount on gravel and, in many cases failing that, walk. Despite it all, I was pleasantly surprised with my own ability; I had definitely overcome the sense of discomfort with the uni that had manifested itself with the last tube change. And I was pleasantly surprised when I arrived in Portage just after noon. My acrobatic prowess, or at least my wild flailing arms and constant, unsteady wobbling, had not gone unnoticed. A local radio reporter stopped me in the industrial outskirts for an interview after receiving calls from curious drivers. Closer to town, a seemingly endless array of construction had converted the outer-edges of the wide throughway into a thin sheer of mud, and so I opted to walk the remainder. Unlike more modern outskirts dominated by a few giant plazas, the edges of Portage tricked me, at first, into believing I was already downtown. Fast food drive-ins and furniture stores made up only half the constant pattern of storefronts, while strange little niche businesses – cleaning supplies here, video transfers there, rugs, etc. – made up the rest. All off them set behind unmarked parking lots and vague traces of rough pavement. Drivers used these undefined spaces like extra lanes at their discretion; another reason to walk, although actual sidewalks were scarce. I checked in at the local newspaper and had a reporter take a story on the spot, before continuing the slow trek towards the supposed downtown. Luckily, I eventually discovered such a place did, in fact, exist: the density of properties increased immediately and sidewalks were even complimented with crosswalks and curbs. I took a much needed lunch break, complete with a delicious fruit smoothie, at Grindstone Bakery and admired the reward for all my troubles outside. Portage is actually a pretty place, at its centre; business fronts from the past ten decades intermingle almost seamlessly and without any hint of pretentiousness, broken up by old and new institutional buildings alike. Although there’s houses and businesses in almost every direction, one edge off the downtown core is visible from the other. In these few blocks, people went about their shopping breezily; they knew this place, clearly, and had grown their routines around its every offering. Unfortunately for me, one of those offerings was not an extra power outlet for a wandering, technology-reliant, self-propelled traveler to discretely usurp temporary control of. I only needed it to spend a couple extra hours writing before making for the night’s stay, but it wasn’t to be. I tried every café and fast food joint on the strip to no avail. Having completed this exhausting, fruitless exercise, it was already time to leave. I had arranged to meet Marve – who I’d earlier met in a diner in Broadview SK – and his wife Darlene at their home just East of Portage. 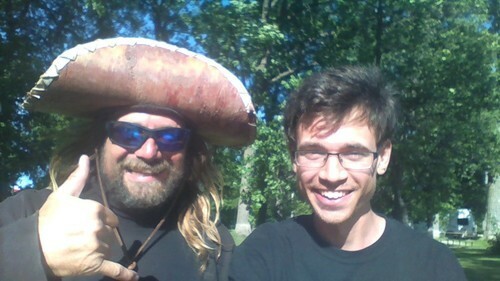 When I met him, Marve had mentioned he was part of the Warm Showers community and invited me to contact him in Portage for a place to stay. It rained on my way out of town, and the going was even slower with increasingly soggy gravel shoulders. The timing, at least, was right; Marve and Darlene returned from work just as I was arriving. Marve and Darlene were fantastic. I emerged from a refreshing shower to find hot, homecooked pizza and a delicious salad. Definitely a great way to end the long day. I hit the hay soon after and was even able to sleep in the next morning. Welcomestop KOA is right between the Assinaboine and teh #1 Highway outside of Winnipeg. By now I was nearly a week ahead of schedule, but decided not to spend two days in Portage as originally planned. 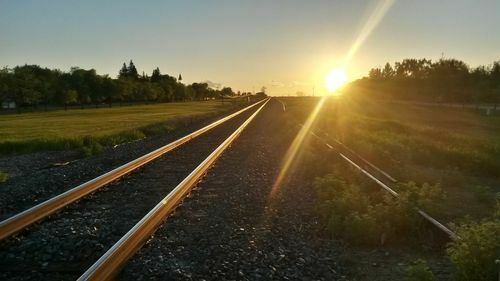 I had a new scheme to bring my girlfriend out on the train for a week-long visit in Winnipeg; it would be her first time traveling east of BC and a great break for the both of us after her miserable 48-hour stint in an economy-class train car. I had a place to stay in Winnipeg with generous relatives, and I’d still have time for a leisurely two-days of camping just west of the city to catch up on work I’d meant to do in Portage. 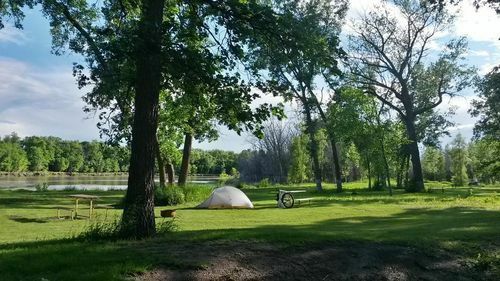 The Winnipeg KOA campground had offered one night free, and was located right on the TransCanada on the beautiful, lush river banks of the Assiniboine. The rain returned en-route and by the time I reached the spot, floods were threatening to break across the province. The campsite itself was largely washed out and pumps were buzzing away busily in the breaks of sun that followed. I was luckily to get a dry campsite, though, and was able to set up my tent and safely stow my gear inside before the next drift of threatening clouds broke over the area. The staff were great and let me hang for hours in a café built onto the office/gas-station where I could work on my laptop. The sun broke the next day and lit the grounds in a wonderful golden light, contrasting vividly with the deep blue hues of the stormy sky afar. I took this opportunity to sit outside and write in between reading breaks of H.G. 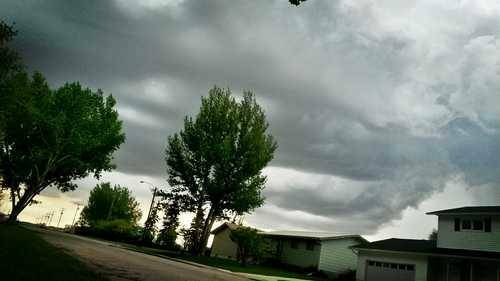 Wells; thunder broke later that day as if to mimic the stormy dramatics of War of the Worlds. None-other than Guiness-world-record-setting, cross-Canada canoeist Mike Ranta passed by the campground. As I was sitting on picnic bench writing on my laptop, a dark blur stirred on the banks of the river in the periphery of my vision. I looked up to see a wild creature clamber up the bank and lumber towards the office. Was it a bear? No, a man, in haggard black garb sporting a long, tangled beard that covered most of his face; a sagging muddied sun hat, baggy hip waders, heavy boots. Where on earth could he have come from? A true man of the bush? Could it be…? I wondered, but he was gone before I could take a closer look. I went back to writing, bemusedly, when a disgruntled, little orange dog bolted into the campground from the same direction and sat, whining for his keeper before turning to acknowledge me with a bark. Unlike the man, the dog’s coat was clean and shining, his hair trim, head proud; it seemed he would accept no less. It was from this dog, Spitz, that I realized my unlikely guess was spot on. I stood up and crossed the park to gaze onto the river bank where Mike Ranta’s fabled canoe was waiting patiently. 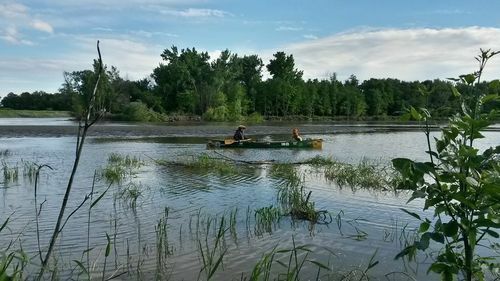 For weeks I’d heard of the man portaging across the country; lugging his canoe through forests and across highways and rowing for mile after mile towards the Atlantic ocean. 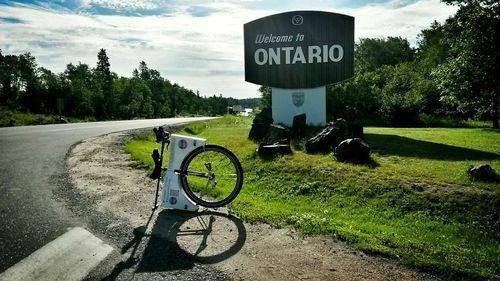 He was setting a Guinness world record for distance and time, but the journey was first and foremost a fundraiser for a struggling youth centre in Northern Ontario. I had assumed Mike Ranta was ahead of me; beyond that, I figured my chances of seeing him were slim, especially in this area rich with intertwining waterways where overland travel would rarely be necessary. And yet here he was, returning from the highway with fresh supplies of two ice-cream deserts. Mike and I west of Winnipeg. 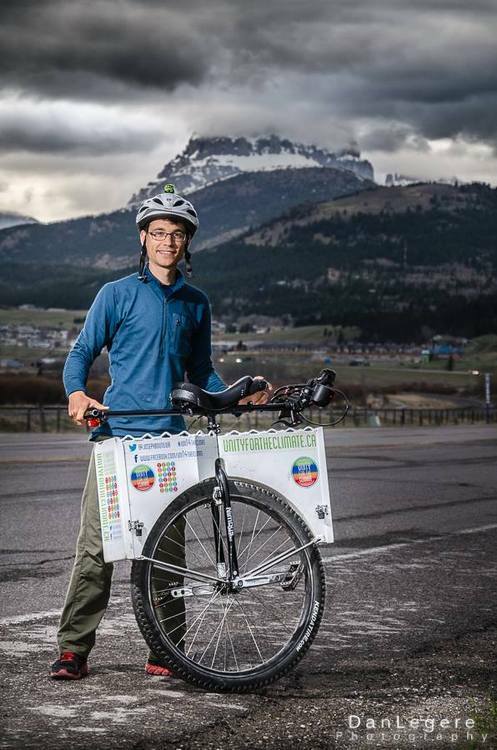 Never thought I’d cross paths with his epic journey of portaging coast-to-coast. I introduced myself to Mike and we talked about the environment and our shared concerned about the government’s lack of balance in development and respect for First Nations. Spitz settled down and warmed to me over the next few minutes as Mike showed off his portable solar panels and downloaded fresh maps onto his tablet. After a couple photos and exchanging information, Mike disappeared back down the shore and soon was drifting back into the current of the winding river with Spitz perched proudly towards the bow, clearly happy to be back on the water. The ride to Winnipeg was longer than I expected, even though I’d been warned that ‘you get to Winnipeg 14 killometers before you get to Winnipeg.’ Indeed, the welcome sign appears on the edge of miles of suburban homes and businesses; on the plus side, the route is relatively flat with few interruptions. I arrived downtown a little before I was to participate in an All Nations Youth Grand Entry march downtown organized by Idle No More Winnipeg and others. I took the long way there, weaving between city blocks and admiring the strange architectural variety that surrounded me. From beautiful, early 20th-century apartments to giant 80s brick plazas to the stark blue tower of the state-of-the-art Manitoba Hydro skyscraper (the most efficient in North America), the city has so many landmarks that they almost seem to compete for attention, each reaching higher or further or at a more striking angle into the complex horizon. The new Canadian Museum of Human Rights awaits its grand opening in Winnipeg. The Youth Grand Entry march calling for sustainability, respect for youth voices and First Nations sovereignty began in the historic Grand Forks behind the iconc Via train station where I would later meet my girlfriend Silvey. The chunky cobblestone road wasn’t exactly unicycle-friendly but I didn’t mind walking past the eclectic indoor market, colourful children’s theatre and children’s museum, impressive red-stoned outdoor auditorium and public art and the park that sloped down to the Red River. It was a great introduction to the heart of Winnipeg, where I was honoured to meet Shanley Spence (who organized the march), Jessica Gordon (prolific metis activist) and Michael Champagne (a true tour-de-force in the Winnipeg First Nations community and a super funny and inviting guy). The march along Memorial Park to the Legislature behind a pickup truck of talented drummers and a parade of dancers was invigorating. It reminded me of the exciting spontaneity and energy of the first ‘flash mobs’ in the INM movement and the ‘Maple Spring’ protests in Quebec and across the nation. The Idle No More movement is alive and well in Winnipeg, where the mantra is slowly but restlessly transforming a city historically plagued by a poverty, discrimination and gang violence. After I gave a brief speech at the legislature and listened to the insightful comments of many other marchers, I met my relative Heather who took my back to the home of her and her husband (and my second-cousin) Richard. Here, I unpacked, showered, and eagerly awaited Silvey’s arrival by train (which, in true Winnipeg fashion as I’m told, arrived almost 3 hours late). 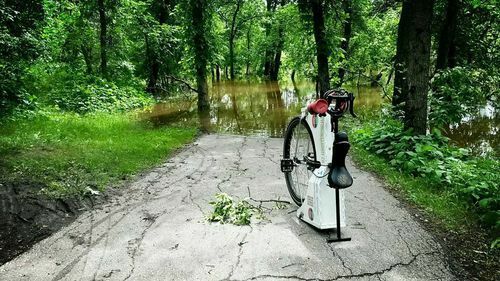 Heavy rain in Winnipeg meant a few washed-out trails and roads leaving the city. 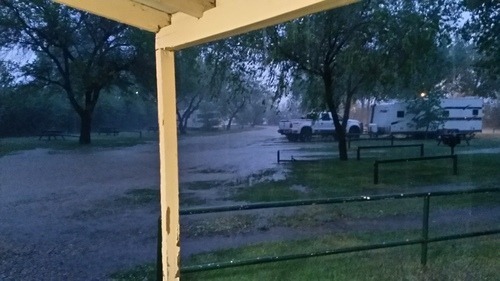 A couple days later, communities further west declared a state-of-emergency for flash floods caused by the same record rainfalls. The next morning I had a rather rushed, live interview with CTV Winnipeg, complete with awkward, failed free-mount. Aside from a couple stints at Café D’Armour south of the Osborne Village neighbourhood and a trip to the awesome Bikes _ Beyond who gave me a new road tire, the rest of my time in Winnipeg was pure and proper leisure. Especially thanks to our fantastic hosts, who refused just about any assistance as they put us up, fed us and gave us many an insider’s tours through every end of the amazing city. 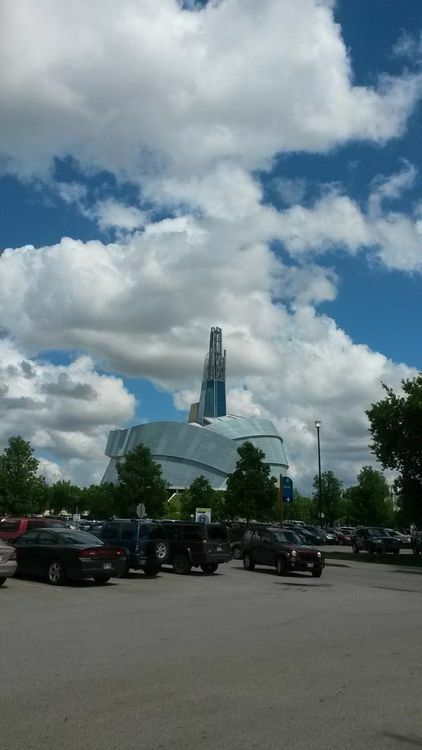 Day trips included the impressive Winnipeg Art Gallery, the lively heritage Exchange District, Assiniboine Forest, Gimli and a bunch of great restaurants, shops and even a couple ice cream parlours. The weather was a total mixed bag but it hardly mattered: it was an awesome time-out from the ride and amazing for my girlfriend and I to spend a week together after many apart. When it finally came time to leave the geographical centre of North America, storms were predicted once again; although it was sunny when I set out, I kept my raincoat at the top of my bag. I headed back towards the TransCanada by way of the Niakwa Trail, but a portion was completely washed out. As soon as I was back on the highway, buckets of rain dropped from the sky. By the time I put the rain cover on my backpack and my rain coat over my jersey, it was already soaking through. Luckily it wasn’t particularly cold out and the paved shoulders allowed me to set a great pace in the first stretch toward Richer 60km away. I first stopped at Ste. Anne, which required a lengthy, wet, and mosquito-laden walk through a construction zone on MOM’s way (#12 highway); I was hoping to dry off at the local motel, but opted to carry on when I heard the cost of their rooms. Rather than backtrack through the construction zone, I got to Richer via the smaller Dawson Road, which at first looked wide and inviting but quickly became narrow with only wet, muddy shoulders requiring yet more walking. I regretted my decision at the time, but only because I didn’t realize that even TransCanada had once again gone shoulderless somewhere along the way. I tried my luck again for a cheap indoor stay at the Richer Inn but it was closed for (any guesses? ): construction. I ended up at the Wild Oaks campground north of town and ran into the office as the clouds cleared, hoping to set up camp before the rainstorm kicked back into high gear. Of course there was someone else at the desk, leisurely contemplating their choice of RV sites. By the time I arrived at my designated site, the relentless wet torent had again begun. I was exhausted by the time I dried to the best of my ability in my soggy setup and would have drifted off instantly had it not been for joyous campfire sing-alongs. At least it was nice to hear that my fellow campers weren’t letting the weather get the best of them. It’s good that I’d been truly refreshed and reenergized with my week in Winnipeg because the next day was unquestionably one of the most miserable on my journey to date (and hopefully not to be rivaled by any in the days to come). I had breakfast at little café called Timberline in Richer on the highway. Another customer wearing a patriotic visor was my sole reminder that it was Canada Day; somewhow I had trouble getting into the festive mood as I rode away only to find that the days of paved shoulders in Manitoba were clearly behind me. Only a foot-wide tease of pavement followed the white line, bordered by about a meter of soft, sandy gravel. 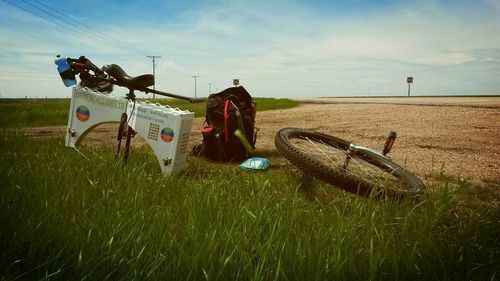 Although it was trickier than the dry, dusty gravel around Portage (especially with my knobby tire replaced for a street tire Winnipeg) but I was able to surf slowly and uneasily through the gravel for the first few miles while only a hint of rain descended. This was the good part of the day. My relatives from Winnipeg passed en-route to a vacation spot and came prepared with a hot cup of coffee for me. Awesome! Unfortunately it was all downhill from there. A construction zone marked the beginning of an eroding, sandy, chewed-up kind of gravel shoulder that persisted for another 60km or more. As the rain picked up, this soft muck quickly became a major headache. The first time my tire got stuck it caught me off-guard; I was able to run-off the fall but the uni took a hard dive and knocked the saddle crooked. After fixing it, I briefly tried riding on the foot of pavement over the white line but when traffic picked up the sense of danger was palpable. I returned to the gravel and a mere 30 seconds later, an oblivious driver sped past with two wheels firmly over the white line and continued in such a way until they were out of sight (regardless, a couple klicks later even that narrow paved portion disappeared). I tried persistently to ride the soggy sand and gravel but after my tire got stuck a further 3 times I gave up once and for all. It was time to accept the fact that I’d have to walk for the rest of the day. Even this was easier said than done; the extra friction of the shoulder required a concerted effort to push the uni forward, and the sluggish pace I ended up walking was a boon for the thousands of mosquitos in the flooded ditch next door (not to mention the rain that rinsed away bug spray as quickly as it was applied). My skin was wrinkled from wet and spotted as I had chickenpox when I finally arrived outside Hadashville where the turnoff was for my scheduled stay. The detour to the campsite on a small sideroad was the first time I was able to ride since the morning, but the destination was less helpful. There was nobody at the campsite office, and the only sign of life in the neighbouring house was a large dog who wasn’t happy with my presence. I thought of setting up my tent uninvited and paying later, but the only empty sites looked flooded and I couldn’t locate the showers. Despite the campsite being practically full with campers and RVs, and despite the fact it was dinner-time on Canada Day, there were no barbeques burning, no campfires blazing, and in fact, not a soul to be seen anywhere. I gave up on the ghostly place and returned to the highway in despair. I rode up to Hadashville hoping for a motel but only found a restaurant. There I was told of a motel a few extra miles down the highway and, so, continued my trek. I finally found the place and checked into my scummy $70 room sometime after 7. I was so happy to slump onto a dry bed that I didn’t complain that the internet didn’t work, the TV didn’t work, and I didn’t have a room key. ‘Can a life-saver also be a complete rip-off?’ I wondered as I faded into a deep sleep. Falcon Lake Provincial Park, MB. I saved myself the trouble of sinking into the muddy shoulders and falling off my unicycle several times the next morning and set off walking. I walked the next few kilometres until brief sections of pavement began to appear at random. I stopped at a gas station with a built-in restaurant to use the ATM (which robbed me of $20, but that’s another story) and the worst of the weather subsided while I took my time eating lunch there. As I approached Falcon Lake the shoulders turned back to pavement for good and the sun was shining by the time I arrived at the provincial campground (conveniently beside a café and grocery store to boot). Here I also met another cyclist from Victoria who had heard of my exploits from the local CBC radio. 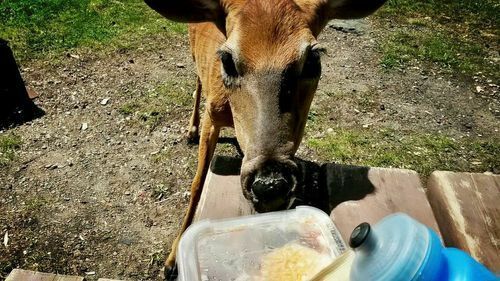 Even by Vancouver Island standards, the deer at West Hawk Lake aren’t shy. Since I’d already got ahead of schedule again in the days since Winnipeg and was exhausted beyond reason, I decided to take it easy the next day and only go so far as the eastern campground in the same park (West Hawk Lake). The weather turned so dramatically at this point that I was dripping, not with rainwater, but with sweat at the end of the short trek. I don’t swim but found a relatively quiet spot along the bustling shores and dunked in to cool off before resting back at my campsite on a sunny, rocky overlook. It was a beautiful spot and a beautiful day, to be sure. Restful? Not so much. Shortly after I crawled into my sleeping bag, not one, two or three but four other camping parties arrived and noisily surrounded me with awkward after-dark tent assembly, complete with wandering flashlight beams and hush arguments. I stocked up on overpriced bug spray at a general store the next morning and crossed the Ontario border, destination: Kenora.